My left foot, 24-hours after breaking bad. I can’t help but think that when it comes to Thanksgiving, I’m operating under some sort of jinx. Ten years ago, my divorce was finalized the day before Thanksgiving. I wrote about that experience two years ago on this blog in a post that struck a chord with well more than a thousand readers after being featured on WordPress. The following year, the essay was reprinted on Better After 50, a terrific site for midlifers. The post addressed the vast changes I grappled with in celebrating a major holiday right on the heels of my divorce, and how, newly remarried, my second husband and I would drive up to Ohio from Virginia, where we had recently moved. Having no home base any longer, we celebrated Thanksgiving in a restaurant. We were with all three of our sons, but it still felt alien to me. Last year, my husband and I very nearly had to spend the holiday apart; he had just taken on a new job back in Ohio, and I was holding down the fort at our Virginia home, beginning, once again, the rituals of packing and preparing a house to go on the market. John could have had his turkey in the dining area of the Residence Inn, where his company was putting him up; I would have had the better end of the deal: celebrating with our good friends in Richmond. But I flew up for a house-hunting trip, and my future daughter-in-law’s parents kindly invited us to join them for their Thanksgiving. Still, it wasn’t quite the same. This now made two years in a row that I wasn’t able to cook for my favorite food holiday. So imagine my excitement this year when, finally settled in a charming 84-year-old house near the shores of Lake Erie, I began orchestrating plans for a Thanksgiving meal around my grandmother’s old table. I began to pull out my holiday recipes. I ordered an organic, free-range turkey from our local market. I put a fall wreath on the front door. Because John’s older son and his fiancé couldn’t rearrange their work schedules, we actually celebrated Thanksgiving and Christmas on Friday, November 8, with a homemade lasagna dinner at which all of our boys were present, joined by P’s fiancé and my son’s new bride. It was lovely. And it’s a good thing we had that at least, because two days later, I fell. Ohio is the buckeye state. 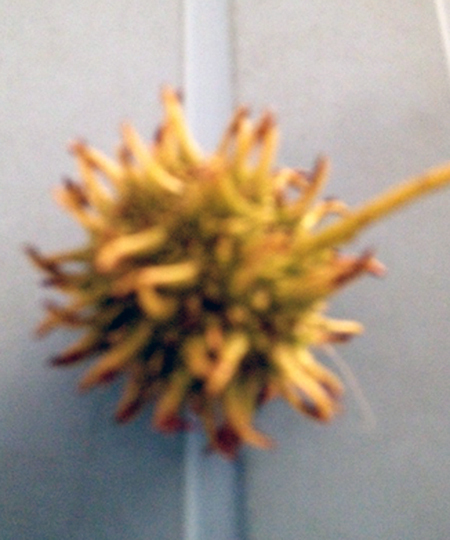 This is a buckeye pod. Be afraid. Be very afraid. Long story short, a trip to the emergency room confirmed my worst fear: I had broken my left foot at the fifth metatarsal. The break, known as a Jones fracture, is an unfortunate one in that these types of fractures take an inordinately long time to heal. Something about diminished blood flow in that part of the foot. 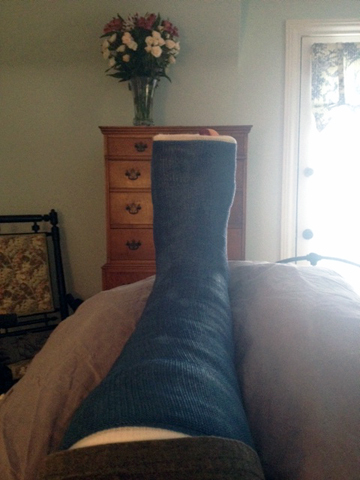 The orthopedic surgeon I saw the following day ordered a short-leg plaster cast and absolutely no walking on the foot for at least six weeks. At least the fracture doesn’t require surgery. Now, let me tell you something about charming old homes that were built in 1929. They do not have first-floor master suites. They typically have only one bathroom, always on the second floor. Homes like ours, which have undergone renovation before we got to them, will have a powder room on the main floor. Ours is an anomaly in that the powder room, for which we’re grateful, can only be accessed by walking down two steps off our kitchen. We must also walk up three steps to enter the back door and two to enter the front. Do you see where I’m going with this? The operative word here is “steps.” Crutches are notoriously dangerous…perhaps as dangerous as buckeye pods. The only way for me to get anywhere vertically in our house is by scooching on my bottom. Unless you work out frequently and have impressive upper body strength (which I don’t), this is not as easy as you would think. Consequently, I have spent nearly three weeks marooned on the second floor of our home. Here’s where I get to the part about being thankful. My youngest stepson is enjoying a gap year from college. He has been here every day during the week since my fall, bringing me meals on a tray, walking our dog (carefully), and performing all manner of tasks and errands until my husband returns from work in the evening. In an attempt to help further his education (maybe not much of a deal for him), I’ve taken him on as an intern for my company, teaching him a few PR ropes. He is assisting me with an important project for one of my clients, and quite frankly, I don’t know what I’d do without him. Luckily my office is on the second floor. 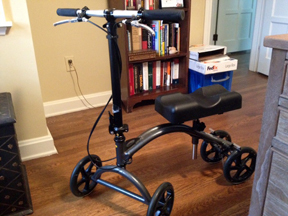 I tool back and forth from bed to bath and beyond (well, to the office) with this nifty knee scooter. My husband is doing the cooking, marketing, also running errands, and tending to me in the most loving way imaginable—all while commuting to work each day. He has the patience of Job. Our new church has arranged for us to have several home-cooked meals; one new church-friend even dropped by our home with altar flowers to cheer me. Two neighbors have helped me out with a couple of breakfasts when C. wasn’t able to be here in the morning. Members of the blogging community have reached out to me with love and good wishes. The positive energy from all of this could get a city off the grid. So this Thanksgiving, when I bow my head before the turkey dinner that my husband will have cooked with the help of his youngest son, I know what my blessings are, and what to be thankful for. They are legion, and I am humbled by the generosity and selflessness of others. But if it’s all right with you, God, I’m going to add a small request during my prayer of thanks: Please. No more broken bones. As You know, because You know everything, this is my third fracture. Readers, I suppose I’ll have to tell you about those other bad breaks some time. For now, let’s all give thanks for family and friends. Wishing you a blessed, healthy, and peaceful Thanksgiving! How did I not know about this broken foot? I am still dealing with a concussion. I think 2013 is one for the record books. I am really glad C is there to help. He has always a great guy! Sorry to hear about the fracture. I broke a bone in my foot 10 years ago just tripping on a rug. I only had to wear a walking cast and can’t imagine the inconvenience you’re going through. Here’s wishing you a good recovery and no more breaks! Like I said, I feel for you! But as we both know, there is so much to be thankful for..broken bones and all! True that, Janie. Thanks. Hope you had a lovely Thanksgiving! Phone wouldn’t let me respond to your blog, Marci… As always a meaningful rendition of your present (thank heavens for husband and stepson) and past Thanksgivings!! May your day be filled with love with the family .., Bye from San Francisco with son and family…! Came through just fine, Rory! Thanks very much for your kind note. Hope you had a wonderful Thanksgiving. Spent my first post-divorce Thanksgiving watching my son graduate from Navy boot camp, and his brother (my youngest) in tow. We drove many hours to get here, braving a winter storm, and unknown conditions, relying on phone gps and loads of patience to find restaurants and stores that were open. While this isn’t exactly the first choice (my next love is going through his divorce now) for Thanksgiving, it was a wonderful turn of events.Life is after all, what we make of it. Lemonade from lemons hopefully. Thanks for sharing your story, Katie. I hope all your Thanksgivings will find you with your loved ones.